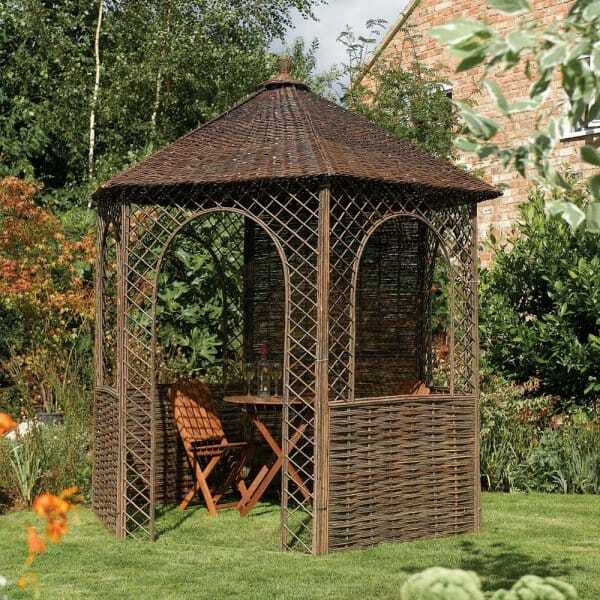 Rowlinson Willow Gazebo: The Rowlinson Willow Gazebo rustic in design, this six sided willow gazebo offers an attractive alternative to the traditional wooden gazebo. This aesthetically pleasing design looks stunning and is ideal for a small table and chairs. At excellent value, this gorgeous gazebo from Simply Log Cabins makes an immediate addition to the garden, but can also can become grown into the garden with climbing plants to create a very attractive secluded spot in the garden. Please note: Accessories are shown for illustration purposes and are not included.